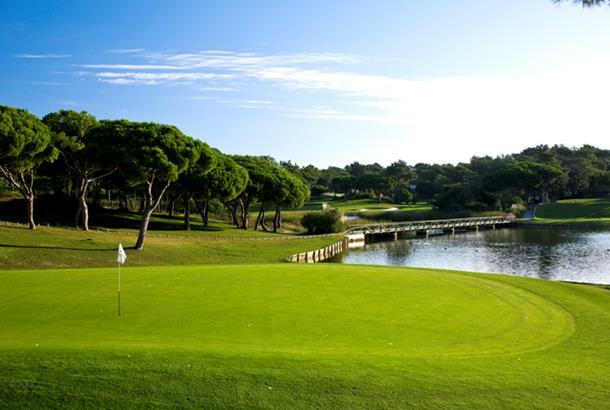 Designed by WILLIAM MITCHELL from the USA and opened in 1974, the Quinta do Lago South course was used eight times for the “Portuguese Open Championship” in 1976, 1984, 1985, 1986, 1988, 1989, 1990 and 2001. It has also hosted many large professional and amateur championships. The favourite of many tour players, this course offers the possibility to hit the greens in regulation in several ways. However, each hole has one easy route and the player who sees this, and has the skill to follow the designer’s intention, and produce sub-par figures. An anti-clockwise loop, it favours the draw shot. This course favours the long hitter, but requires the player to pick a particular route to score well. Although both anti-clockwise loops, the first nine favours a draw, while the second favours a fade from the tee. Holes 3, 15 and 17 features lakes, which must be negotiated. Holes 8, 10, 15 and 18 are the most testing for the scratch player while holes 2, 3, 5, 12, 13 and 17 offer the best possibilities of birdies. An enjoyable experience for players of all standards. Everytime I play this course in blows me away. Always in good condition and not the most expensive. It is simply a collection of 18 really good, solid golf holes. This is not a tourist course and while it is very playable it is a serious test of your game. This course should be the first on your Algarve list even if the Algarve has seen a lot of good additions to its course list over the last five years. Quite a long course but every hole is different and many holes quite spectacular. We decided to walk the course and take in the views. It shouts out class and the villas overlooking the course are magnificent. I find it hard to find fault in anything to do with course, worth every penny. Plenty of water and memorable holes. A must.